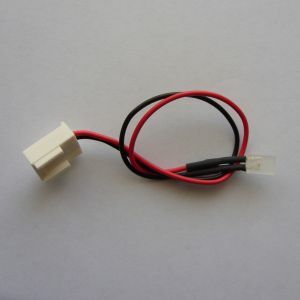 Note: Switch only supplied (with cross point insert) - if a key cap is required please check my breadbin keys to see if I have one available separately. 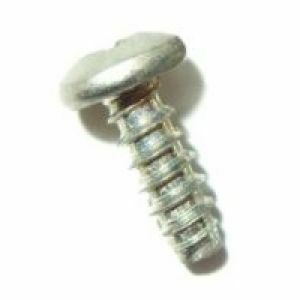 For the standard metal-springs-under-all-keys breadbin C64s only. 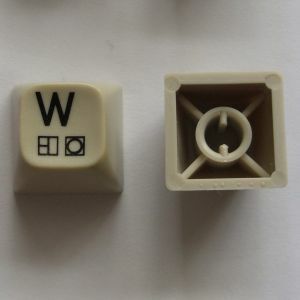 Will not fit 'Type 2' breadbin keyboards that have white plungers (which have a circular keylock switch) or the C64C keyboard. Note: Switch only supplied - if a key cap is required please check my breadbin keys to see if I have one available separately. 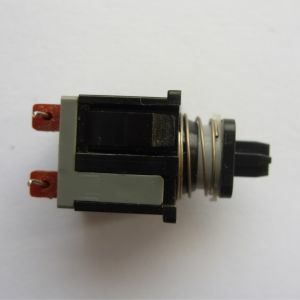 'Breadbin' (Brown key) C64 keyboards also occasionally have this type of switch. 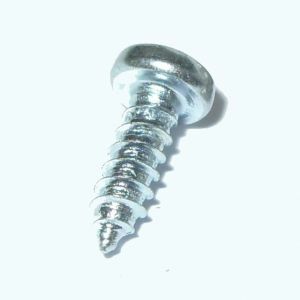 (They can also be used in place the type shown above but the Shift Lock key will lie about 1mm lower than it should if this is done). 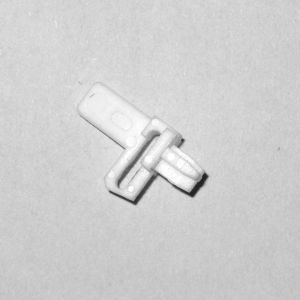 These clips press into the main plastic body of the keyboard assembly and hold the metal rod part of the space bar mechanism in place (there is one at each end). 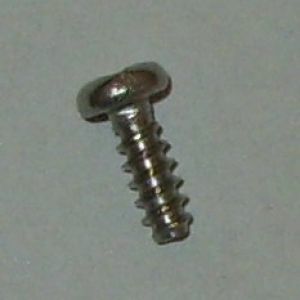 From the "Type 1" metal spring breadbin keyboard (space bar's retaining metal bar clipped in at the front). 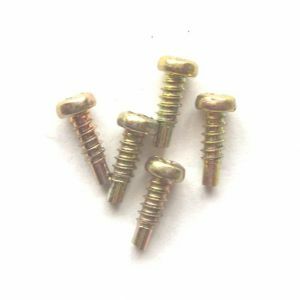 These are the tiny gold-coloured screws that fix the keyboard PCB to the black plastic body. 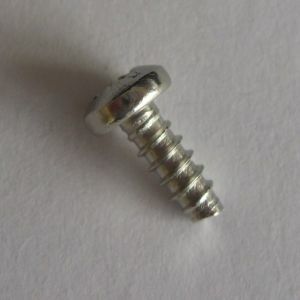 Supplied with two short wide headed screws that hold down the keyboard and two 10mm self-tapping screws that hold the brackets to the case (through the motherboard). Note - these are too tall for Royal Mail's "large letter" 25mm postage tier hence the shipping rate increase when ordering. 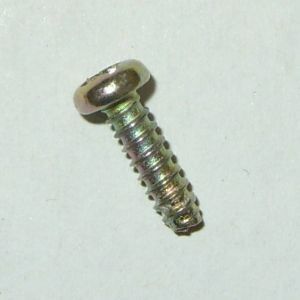 These types have the longer tip key-cap fitting (approx 5mm long cross section tip). Key-caps designed for the shorter (~3 mm) tip plungers do not fit as well so it's best to match the plungers to the rest of your keyboard (and/or keycap to be used). 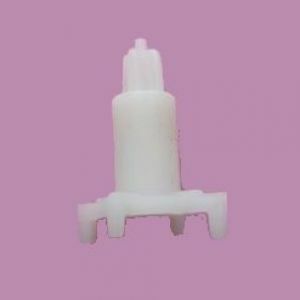 Shorter tip plungers available below. 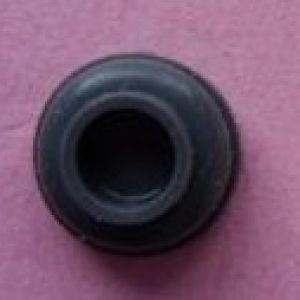 These plungers have a shorter (approx 3.5mm) tip as usually found on the C64C (white) keyboard, but occasionally also on breadins. Key caps designed for both types fit well. 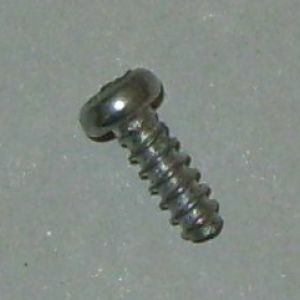 From a standard metal spring Type 1 C64 keyboard. These plungers have an unusual fitting - instead of the normal cross-point, they are hollow with a slotted top (please see photo). 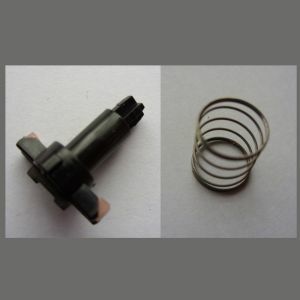 Plunger and associated spring supplied. 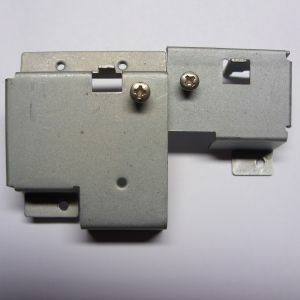 Note: As with the other breadbin keys I sell, the plunger fitting will be suited to either 3mm or 5mm plungers at random - the correct type for the key is supplied should you need to replace yours. 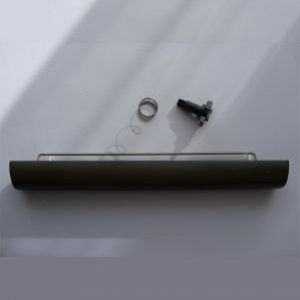 Includes: Space bar, spring, plunger, bubble contact and metal bracket. Colour grade 1.1 - almost no yellowing apparent. 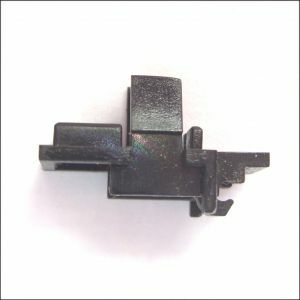 Used, but clean and undamaged keys from a standard UK mechanically-springed C64 (breadbin) keyboard with grey function keys. 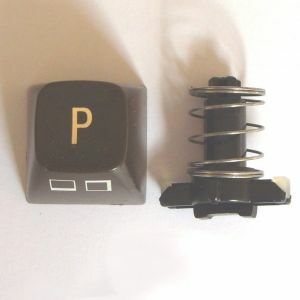 Each key cap includes an appropriate plunger and spring (in some cases you may need to replace the plunger present in your keyboard - see this page for info about this). 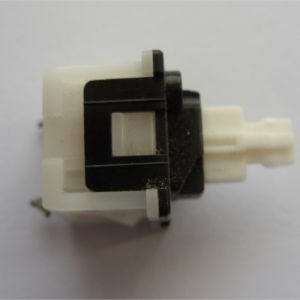 The Shift Lock key is supplied as cap only (ie: without the cross-point insert etc). See the items listed lower down for the other designs of key caps used in breadbins. Please note: As with the rest of the C64 plastics, its keys have usually yellowed with age - this is most noticeable on the main character printed on the key tops. 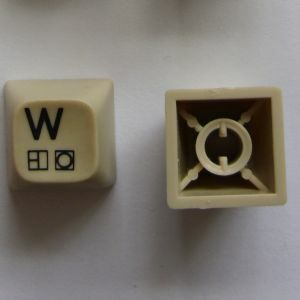 To assist in matching your own keyboard I have split the keys I have for sale into groups (ranging from very slightly yellowed to noticeably yellowed - Grade 1.5 to 3 in this diagram). Obviously, this is all quite subjective and exact matches are impossible, however a "close enough" matched key is usually unnoticable within the full keyboard. The following "Grade 1.5" keys (which have the least age yellowing) are currently available. The spacebar is listed separately. Z X C V B N M / , . Please specify which key you require in the Special Instructions box during checkout - thanks! Spare Keys For Springed 'Breadbin' C64 - Grade 2: Some yellowing. As above but "Grade 2" (text is cream colour). The following keys are currently available - all from a UK keyboard. Please refer to this diagram for colour grade comparision). Space bar is listed separately when available. 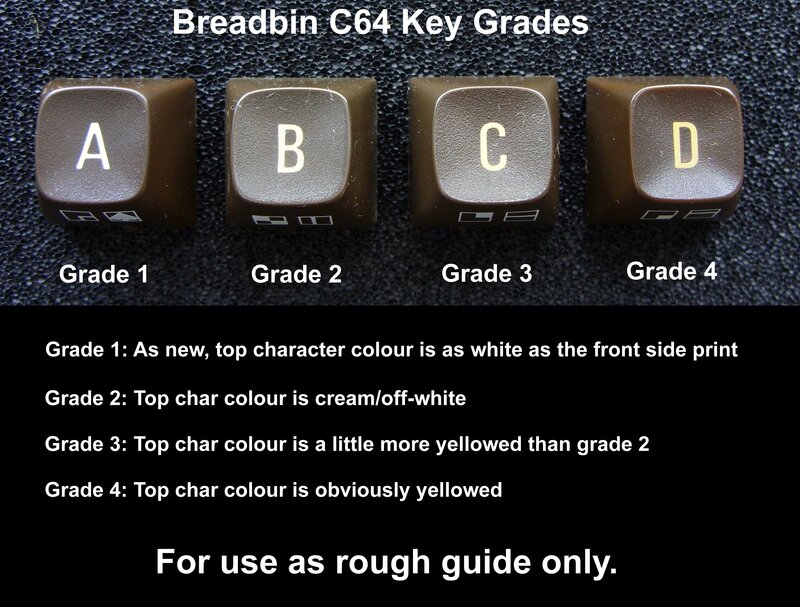 As above (IE: Breadbin Type 1: All keys sprung) but Graded 2.5 in my colour comparison diagram). The following "Grade 2.5" keys are currently available. The spacebar is listed separately. Shift Z X C V B N M , . 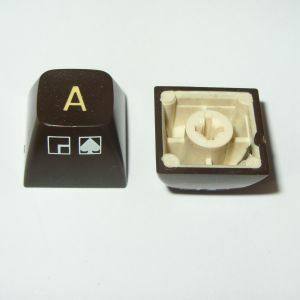 Spare Key Caps For Springed 'Breadbin' C64 - Grade 3: Average Yellowing. As above (IE: Breadbin Type 1: All keys sprung) but Graded 3 in my colour comparison diagram). The following "Grade 3" (noticeably yellowed) keys are currently available. The spacebar is listed separately. 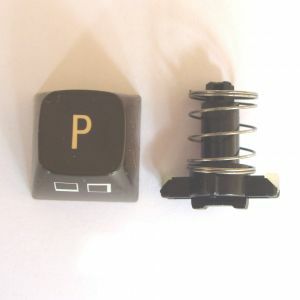 These key caps are from the less-common C64 breadbin keyboard which does not have metal springs beneath the keys (apart from the Space Bar). They do not fit the plungers of the original springed keyboards. 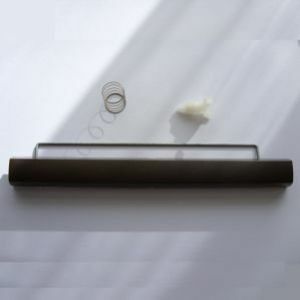 The plunger and bubble contacts are shown to illustrate the fitting type and are not included - these are available separately below - please scroll down. 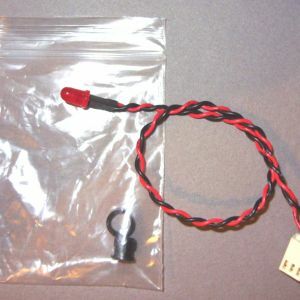 Keys are used but clean and undamaged. Note that due to age there will be some yellowing noticeable in the key top lettering and the body of the function keys - I would grade them as appox 1.3-1.5 on my colour chart. The following keys are currently available - all from a UK keyboard with grey function keys. Space bar is listed separately (when available). As above but these I would grade as appox 2.0-2.5 on my colour chart. As above ("Breadbin TYPE 2" keybioard) but graded as appox 2.5-3.0 on my colour chart. The following keys in this colour grade are currently available. Space bar is listed separately. Used, but clean and undamaged keys sold individually. 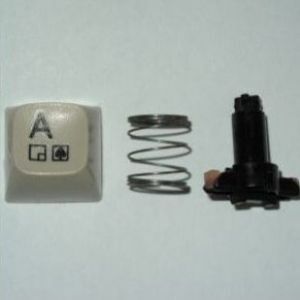 Each key includes a plunger and spring - though these are available separately below if a key cap is not required. (Shift Lock does not include the switch). The Keys are from a standard UK mechanically-springed C64C (white) keyboard. There were at least two key designs - these keys are the type with all the characters printed on the key tops (nothing on the front) and the "Shift" lettering offset. They are clean with intact printing. 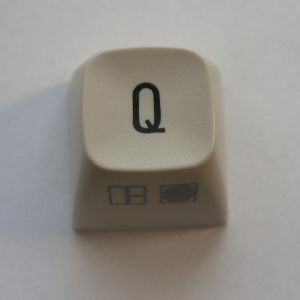 The following "Grade 2" C64C keys are currently available. Space bar is listed separately when available. As above, but Grade 3 : Obvious age yellowing. Please see this image for comparison. 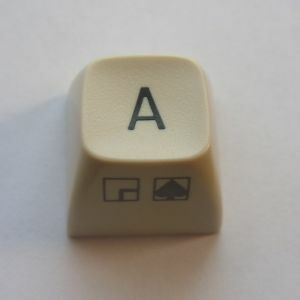 The following "Grade 3" C64C keys are currently available. Space bar is listed separately when available. 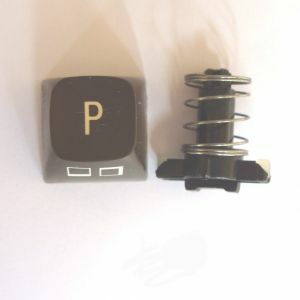 These keys are from the rarer early C64C keyboards, which have characters printed on the front (in grey) and top (in black). 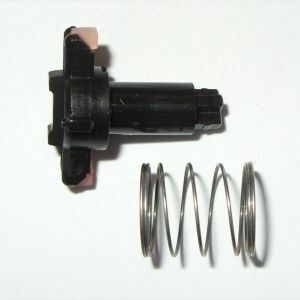 They use the standard spring / 3.5 mm type 1 cross-point plunger which is included (these are available separately if a key cap is not required). Shift Lock does not include the switch. The Space bar is listed separately when available. 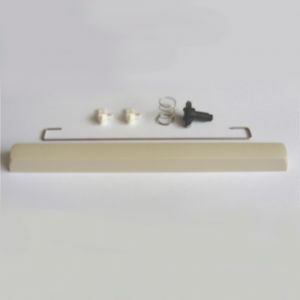 For the less common version of the Commodore 64 breadbin keyboard which does not have metal springs under the key caps (apart from the space bar). Original part, used but good condition. Key caps from a C64C with unusual variant plungers (which I call "Type 3" - please see photo). 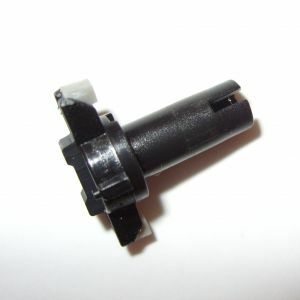 Includes plunger and spring - which are also available separately if a key cap is not required. (Shift Lock does not include the switch). Grade 1.2: Very Little yellowing. (Please see this image for colour comparison.) Clean and undamaged, sold individually. 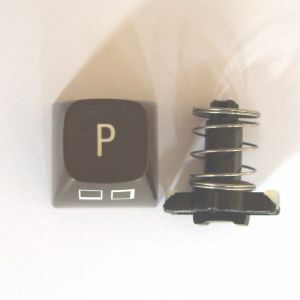 The following "Type 3" C64C keys are currently available. Space bar is listed separately when available. As above but grade 2.0: Some age yellowing. (Please see this image for colour comparison.) Clean and undamaged, sold individually. 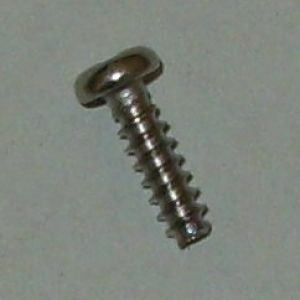 The following "Type 3" C64C keys are currently available. Space bar is listed separately when available. As above, but age-yellowed so Grade 3. 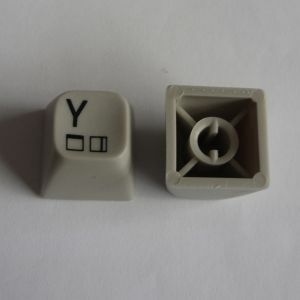 The following "Type 3" C64C keys are currently available. Space bar is listed separately when available.